The public use railing can be extended using new units to cover several sides of the mezzanine protecting a bigger surface of it. With these new posts, the railing extends along the mezzanine surface improving the height security. its assembly is easy and there is no need of special works. The public use railing extension strengths a great resistant product that gives more proteccion not increasing the weight of the structure. Its assembly can be adapted modularly to get two extra meters lengthwise. Once it is installed, it reaches a height of 110 cm. The wooden skirting board is 47 cm tall and the distance between each of the three handrail tubes is 20 cm. The railing meets the french regulations. The kit is formed by two posts and handrail tubes. If you want to join the handrail in the corners of the railing, you would have to acquire the corner unions separately. 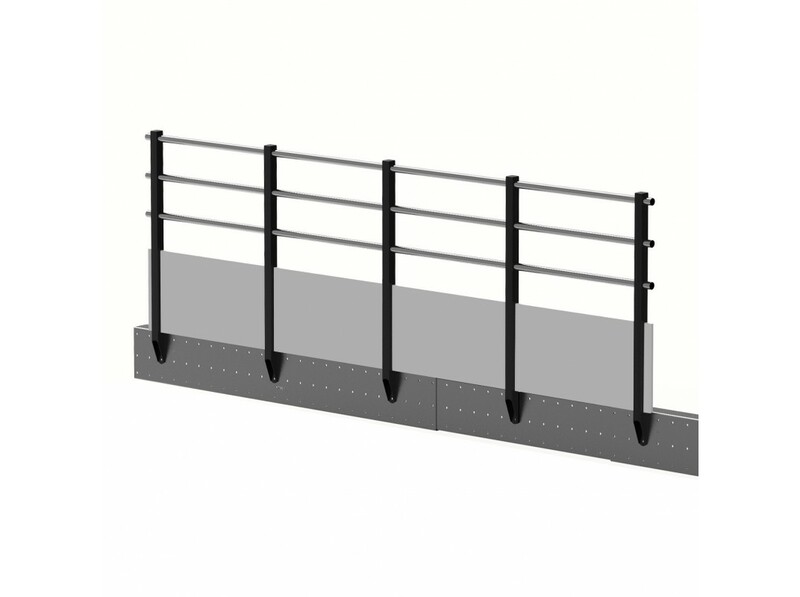 The general use railing can be located in a Mezzanine TXL32 as well, for which you would need to acquire as many appropriate connectors as railing posts. Is the XL range delivered differently? There is a slight difference with the rest of the ranges. In order to deliver mezzanines XL, the delivery location should be accessible to a truck/long trailer (maximum mass admitted up to 36t). If there are access restrictions for this kind of trucks, there could be additional costs due to the necessity of transferring the merchandise to a smaller vehicle. Should you believe it exists any kind of restriction, please contact us. The customer should take care of the merchandise unloading process. That unloading should be made from the lateral sides of the truck (this kind of truck do not have back liftgate). We deliver the product packed with pallets at the bottom, so its unloading should be made preferably with a forklift.